A juicy roasted chicken is just one of those things that defines comfort food to a lot of people around the world. That mouthwatering taste and the smell of a perfectly cooked bird is pretty irresistible. However, the time it can take to roast a whole chicken…well, it can make the idea of a store-bought, rotisserie version a pretty-tempting, often less-healthy choice. At least, that’s what most people think until they learn an AMAZING, easy technique for roasting a whole chicken in half the original time called, “spatchcock”. Have you heard of it? First, take a whole, raw chicken and unwrap it in the sink or over a deep pan to keep the mess at a minimum. Pull out any organs that might be inside and put them in the chicken wrapper to toss unless you plan to use or freeze them. Let the chicken sit out on the counter in a deep dish or on a plastic cutting board for 1-2 hours if possible to bring to room temperature for even cooking. While your chicken rests, mix seasoning of your choosing together. We love that you can choose any flavor you want with this technique from a simple, traditional rub to fresh herbs and global flavors. It’s really your call. You could also think about making a simple sauce or a gravy if you have the time. The only other ingredients you will need by your side for later are olive oil (or spray oil), salt, and pepper. For tools, save more time and pull out your sharpest shears (preferably kitchen shears) and clean them thoroughly. You could use a very sharp knife, but raw chicken can be pretty darn slippery and shears make the process easier and faster. You will also need a cookie sheet (non-stick will be easiest to clean) and a spatula, preferably the widest one you’ve got. Oh, you will also want to pull a bunch of paper towels and have your trash bin close by. Once your chicken is room temp, preheat your oven to 425 degrees Fahrenheit. 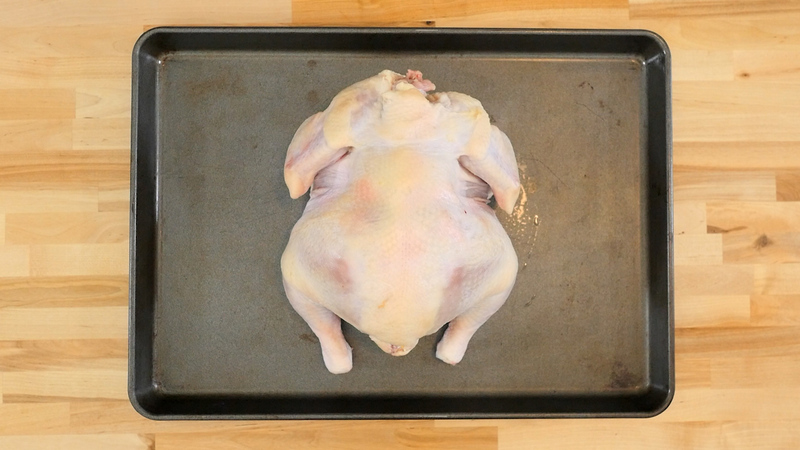 Turn your chicken so the spine is facing upward and the wings are facing away from you. Take some paper towels and pat the exposed side of the chicken dry, then take your kitchen shears and cut a straight line all the way through both sides of the spine from front to back, completely detaching the spine. If you want to make chicken stock, you can save the spine and freeze it for later. Now, turn that spineless chicken over and spread it wide, skin side up. Put one hand on top of your other and place your palm on the middle of the chicken. 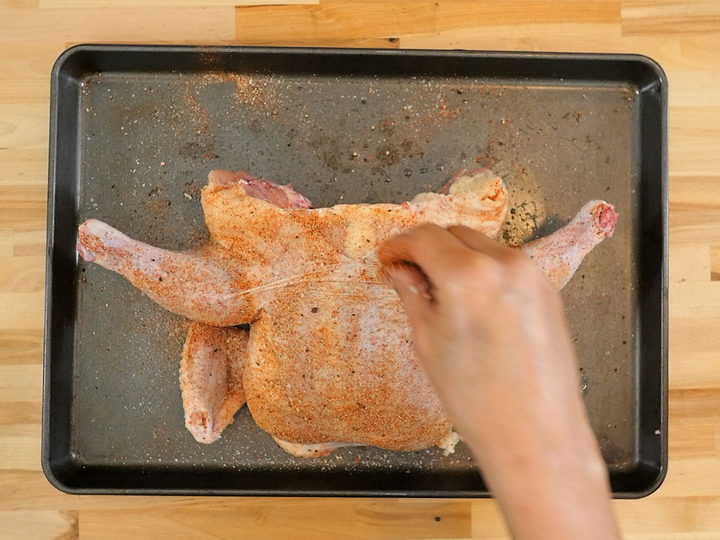 Press down with your body weight on your hands until the chicken flattens out. Don’t worry, you might hear a little pop from the sternum breaking and that’s a good thing. Congratulations! At this point, your chicken is officially spatchcocked. Pat both sides dry so the skin will be ready to season and will crisp up nicely. 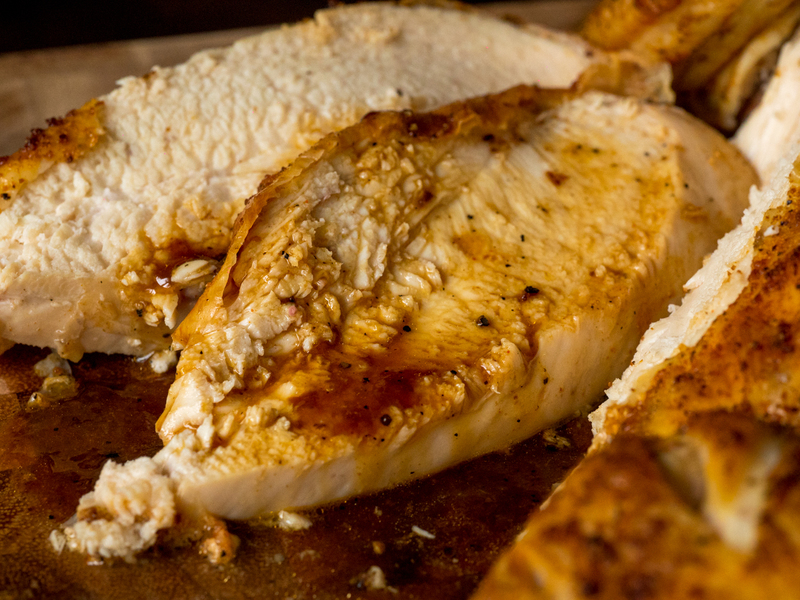 We recommend seasoning both the meat and the skin of the chicken. The way you do that is by loosening the skin from the body of the chicken by gently inserting one or two fingers in-between the skin and the body from the edge closest to you. Loosen the skin, creating a pocket-like distance where it is still attached, but where there is still room to season. Take your fingers out as soon as you have done the best you can. Put one third of your seasoning inside the pockets you have made on the body of the chicken and start rubbing to spread it out as evenly as possible. Once you have seasoned under the skin, turn the chicken over and pat the chicken and the surface of your cookie sheet as dry as you can with more paper towels. Season the cavity side of the chicken, reserving half or more of your seasoning for the skin. Be careful to season evenly everywhere, then turn the chicken over again, skin side up. Pat the skin dry again and pull it as tight as you can over the meat. Evenly sprinkle seasoning over the skin, including the under areas of the legs and wings so flavor is everywhere. Gently rub your reserved seasoning in the skin thoroughly, then drizzle or spray 1-2 tablespoons of oil over the skin side of the chicken. Make sure the skin is nice and smooth over the meat and place the chicken on the sheet pan in the oven (mid-rack) and bake at 425 degrees for 45 minutes. We recommend rotating your chicken pan at the 30 minute mark. If the skin reaches the browning point you wish before 45 minutes, place the chicken on a lower rack and finish roasting. Check the temperature in the thickest part of the chicken, the thigh, and make sure it reaches 140 degrees. Be sure that after you take the chicken out you let it rest, uncovered on the countertop for 10-15 minutes before slicing for the juiciest chicken possible. Don’t throw out the pan juice! Once you slice your chicken, make good use of the juices from the pan, drizzling them over the top and finishing with a bit of salt and cracked pepper before serving. Unwrap chicken and bring to room temperature, approximately 1 hour. 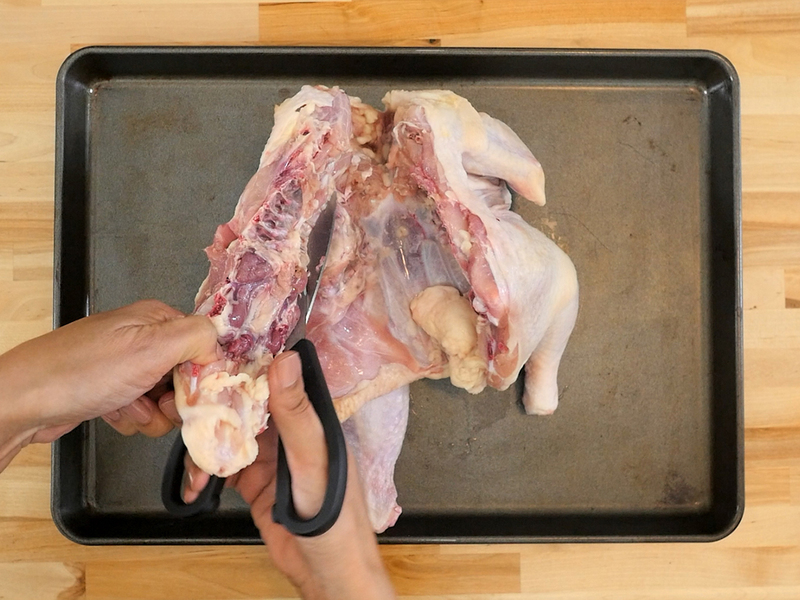 Remove the spine of the chicken by cutting with kitchen shears on both sides from front to back. Spread the chicken out, skin side up and press down on the sternum to make the chicken lie flat. Separate the skin from the meat, creating pockets on both breasts and thighs by inserting two fingers in-between and loosening the skin. Rub 1/3 of the dry rub on the body of the chicken, under the skin. Turn the chicken over and season the cavity with 1/3 of the rub. Turn the chicken over again and pat the skin dry with paper towels. Reserve 2 teaspoons of rub then sprinkle and rub the rest all over the skin. Drizzle 1 tablespoon of olive oil on the skin side of the chicken, gently patting it all over evenly. Sprinkle the reserved rub over the skin side of the chicken. Roast chicken skin side up for 45 minutes. Before slicing, remove and let the chicken rest for 15 minutes to seal in the juices. After slicing and before serving, drizzle with pan juices on the chicken then add salt and pepper.